Baby panda is started - the black is its arm. This is coming along at least. On the round robin, since I didn'thear from Muriel, I went ahead and started the sun in the corner. 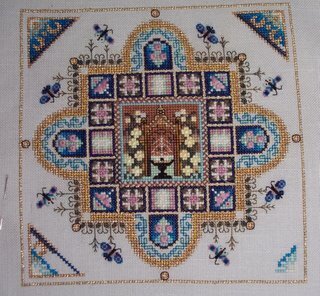 I'm using two colors - the same yellow she uses in the border and one of the DMC Variations - 4090. The checkerboard looks quite a bit more subtle in person. It's going fairly quickly and I might have time to put something else in. Not sure what, though. I've done it again - overcommitted on ornaments. 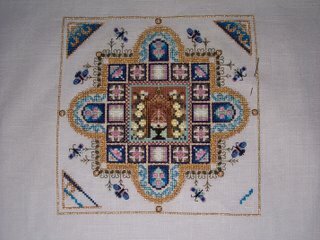 I have to mail one out by December 5th and take another to my local guild meeting on the 11th. 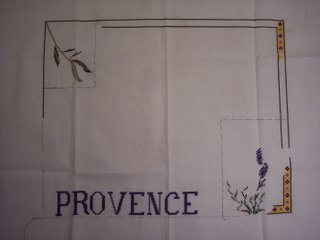 One of these is a freebie from Isabelle Vautier's blog and the other is from the October Gift of Stitching. Started both this week and alternating working them between each of the other things on my list. 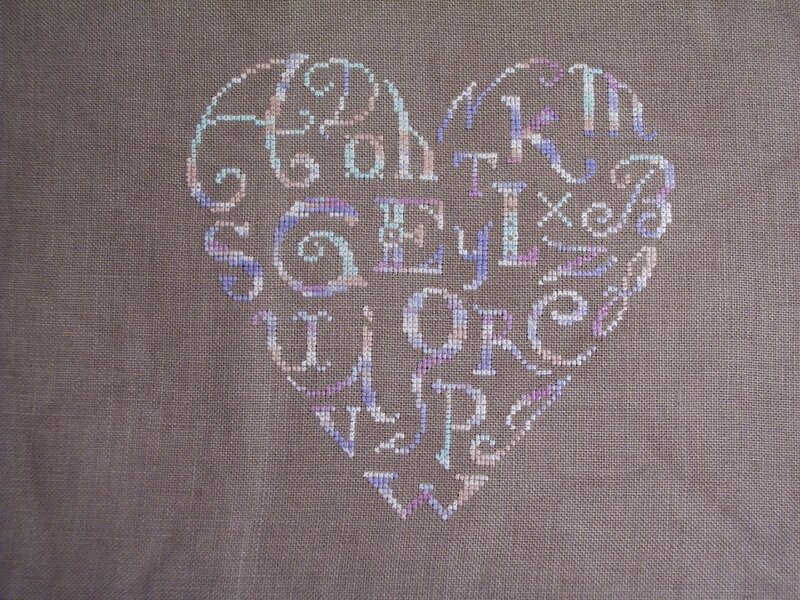 The heart is about a third done. The square has a long way to go. I'll get them both done in time, I think. 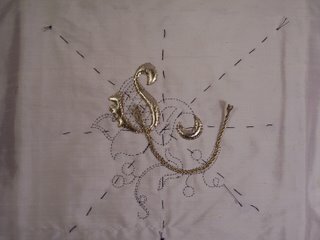 If I don't, I have another thing stitched up that I can finish as an ornament. I really need to have my husband put a coin or ruler into the picture for scale, but the width of the strap is between a penny's and a dime's diameter. 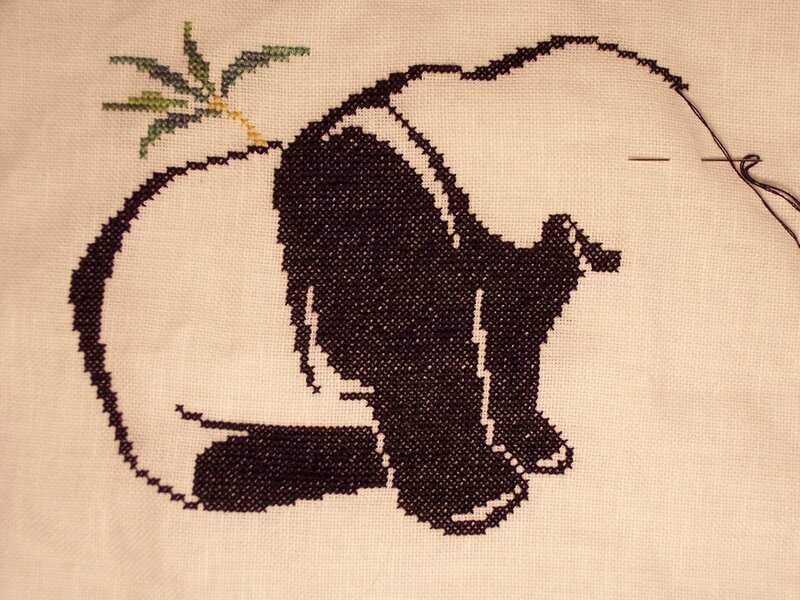 I've gotten about seven inches done ... only thirty-six more to go. 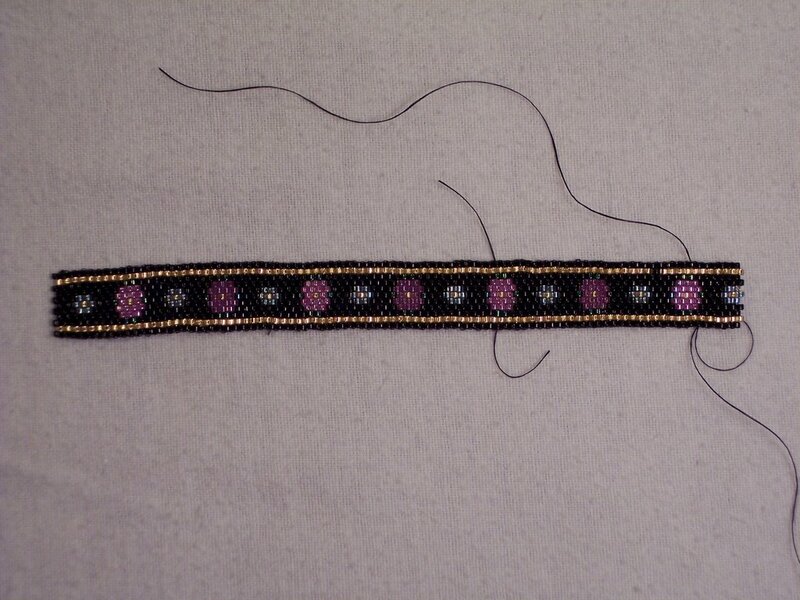 I think it's looking pretty good for a first attempt at a beaded design. I think I'm going to alternate working on this and some of the other parts of this project. 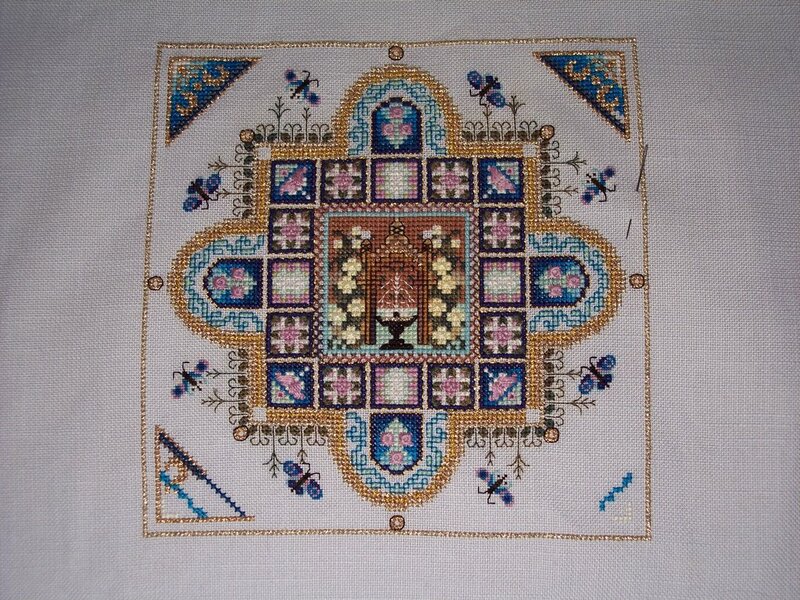 The auction needlepoint is going kind of slowly, but it's at least being worked on. 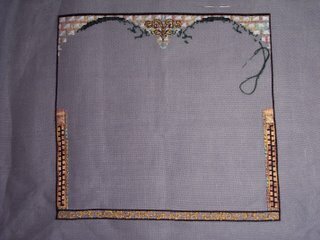 I got another part done on the Bargello and Buttonholes. 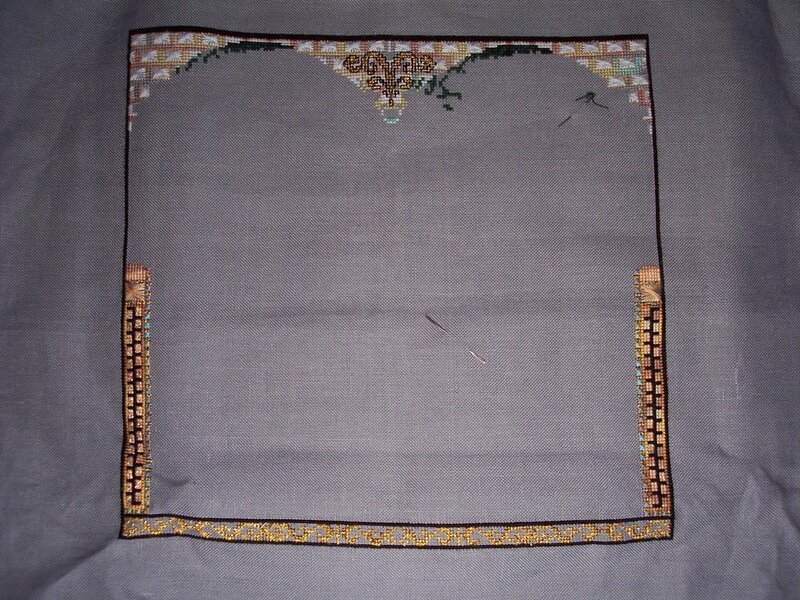 Now to put the interstitial elongated crosses and tiny crosses in the red part of the border. 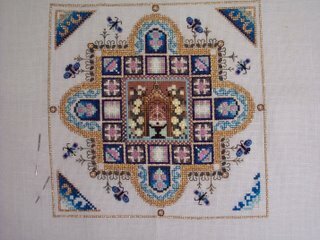 Progress is visible on both of these - all the corners are done on the Medieval Mandala except the bottom left. Once I finish that corner, I'll be done with part 3. Should be this week. 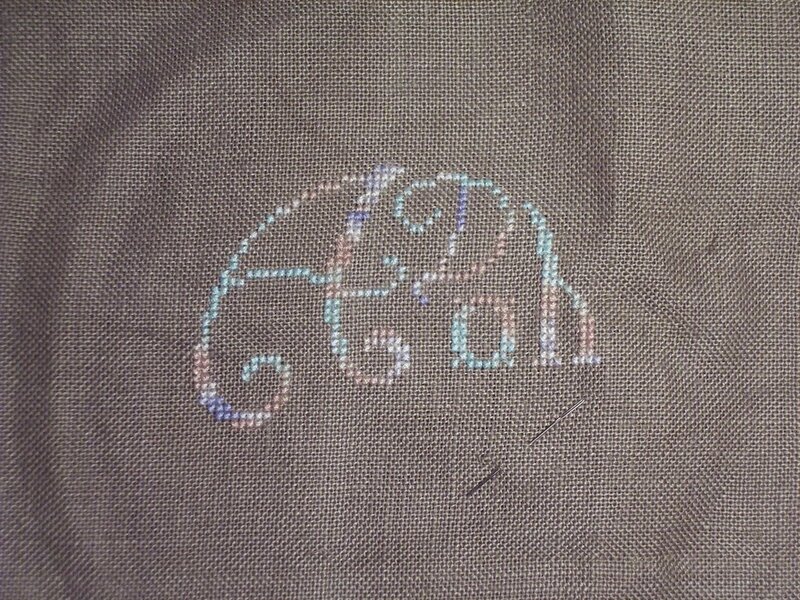 On the Midi Mystery, I've started a third color on the arch and have gotten pretty far on it. I've been able to stitch more than usual because I've been going out running around for my children less than usual. I like that. 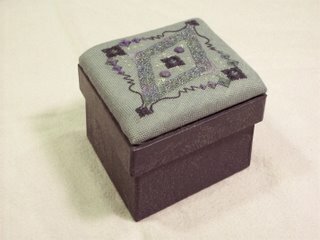 My husband mounted my stitching from seminar on the box Denise Harrington Pratt provided. I think he did a much better job than I would have! I'm still debating putting the cording around the edge like she has hers. I'll probably put it on on Sunday. Anyway, it's pretty much an heirloom piece now. I like it. The pictures don't show how really green and marbly the box is. 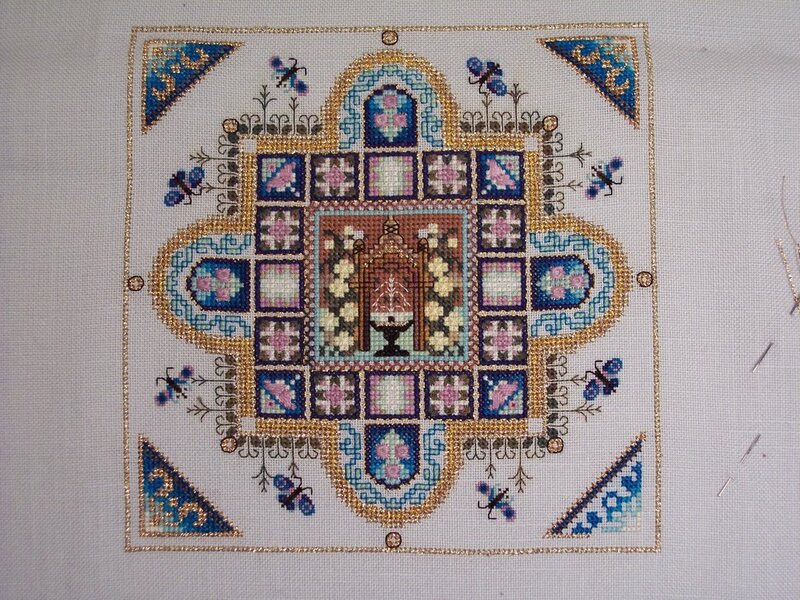 I have another one of her kits to make. Will probably get to it after the beginning of the year. I got all the stems on the flower done this week. 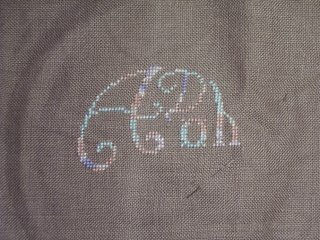 The stitching looks good, and this really does go very quickly when worked on. I'm not sure what the next step is, but I'm pleased with how it's come out so far. 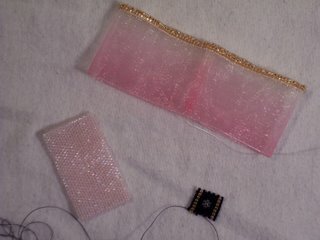 Taking those huge copper wires through the silk gave my hands a workout and I'm surprised it didn't damage the silk. Anyway, I'm pleased with my first attempt. 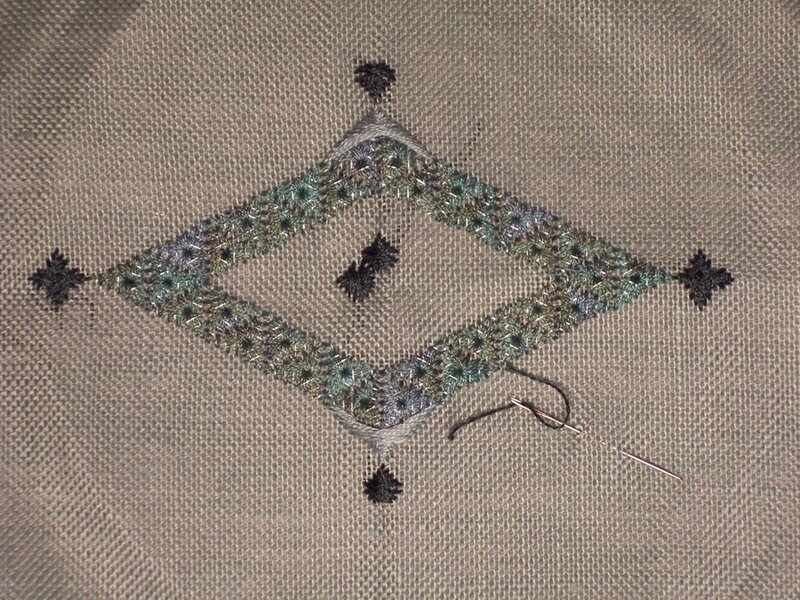 The original directions called for the bargello circles to be filled with ecru eyelets in size 12 perle ... it faded into the background, like the elongated stitches do, but worse. 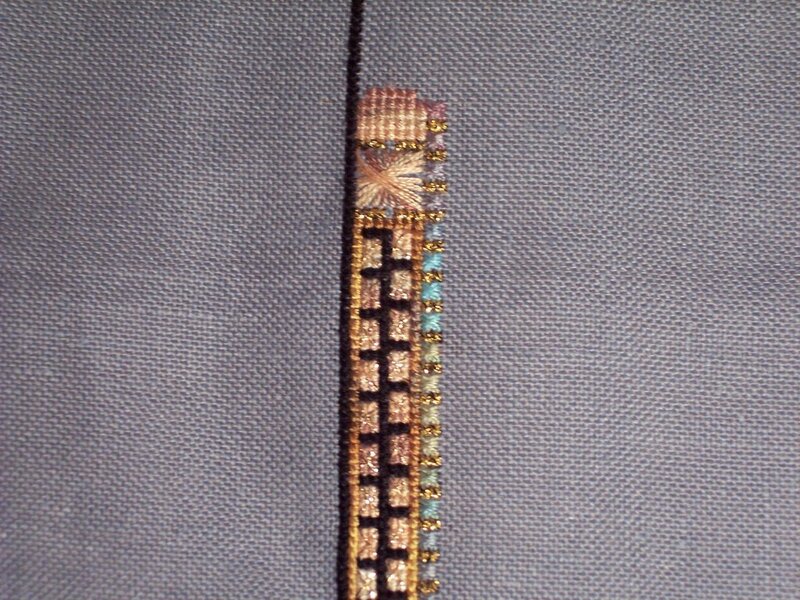 So I used Kreinik braid on them. I think it looks a lot better. 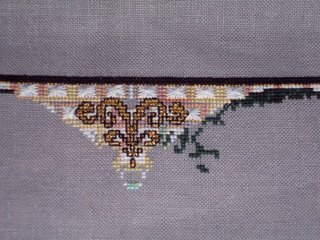 I also added really fine gold cord to the elongated cross stitches to make them a bit less subtle too. 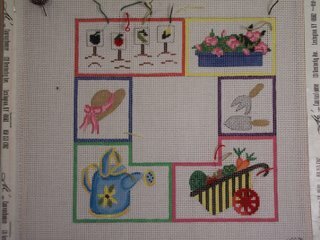 After this picture was taken, I've finished the bottom row of the red "flowers" and am almost done with the side row of them. 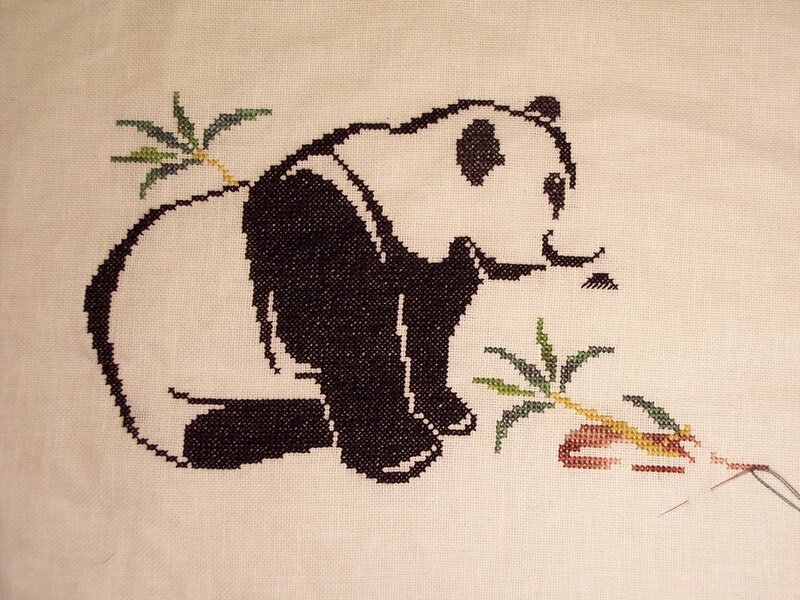 There are filling stitches and such on them, too. Because this hasn't been seen in a few weeks, I had my husband just take a picture of it all. He split it up. 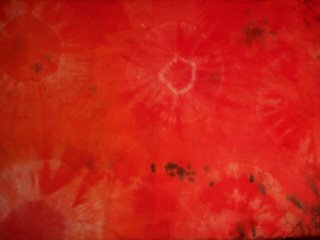 Since I just picked this up again last week, the only thing that's progressed in the pictures is the whitish peyote stitched inner rose. I got it completed. Since this picture was taken, I've added two more inches to the strap (the tiny black bit of peyote stitch). My daughter loves it so far. Since I'm working on the second half, I get to add some color to the work other than black. It's going fairly quickly because I took it as my mobile project on Friday and had a lot of time away from home to work on it. I'm still on schedule for it, I think. I'm just pleased that I can see progress on everything this week. It's a good feeling. I volunteered to stitch a piece for the ANG auction during seminar next year. This is what they sent me. 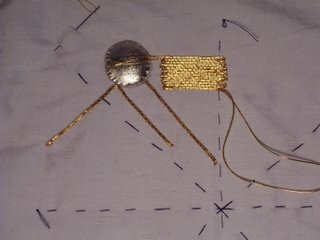 I got a really good deal on a lot of Sheep's Silk from Thread Gatherer on ebay, so I'm using it to stitch the piece. As you can see, I barely started it before Timothy took the picture. It's due back to the coordinator by March first. I'll be putting some specialty stitches in it, but I have to figure out where looks best. 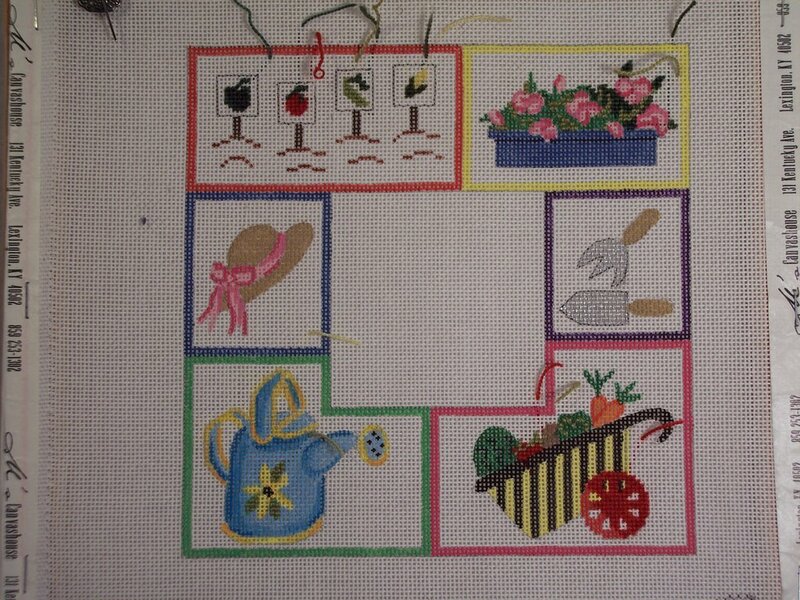 I've already gotten all the green done in the upper left square and about half of the green done in the upper right. 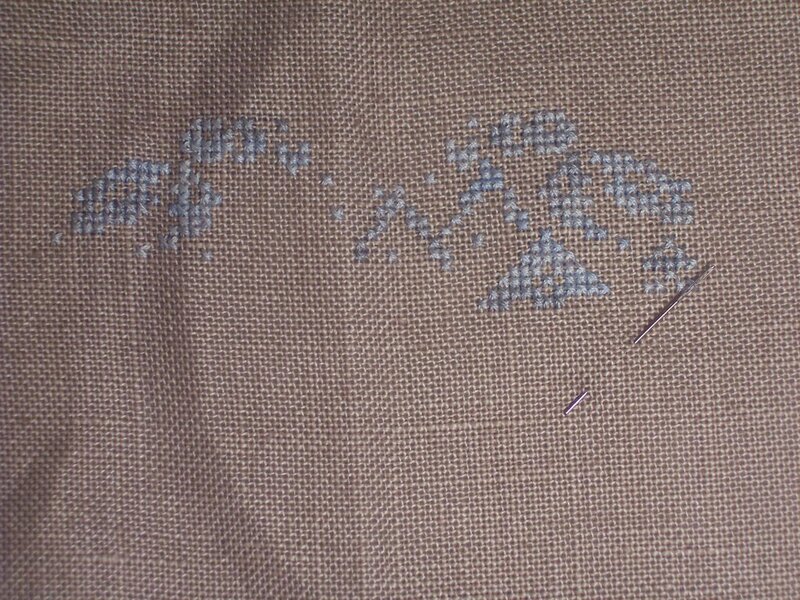 I managed to do the dimensional couching on the practice sampler, but have decided I'm going to trim all those ends instead of plunge them. The privileges of it being a practice piece. 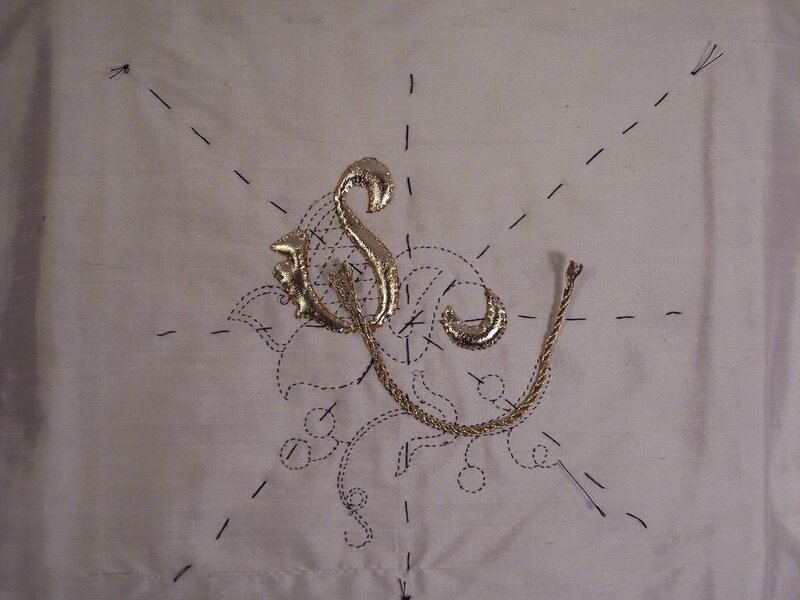 On the other hand, I've started couching the stems on the main piece. 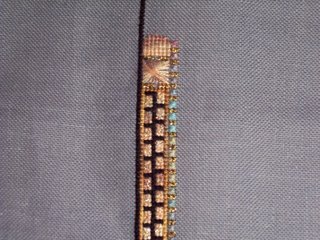 As of this afternoon, the gold twist is lined with copper and copper also is on the biggest curlicue on the lower left. The last bit of the stems and curlicues will have the gold and copper twist on it and I'll get to it this week and then plunge all the ends as they say to. 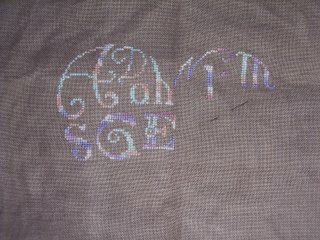 I'm finding that when I actually do stitching on this, it goes really quickly. 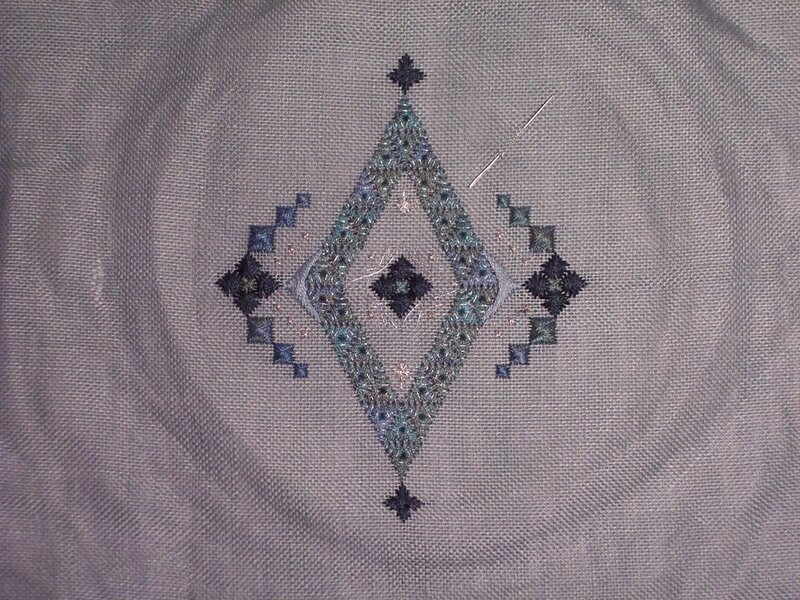 Here's the diamond done stitching. 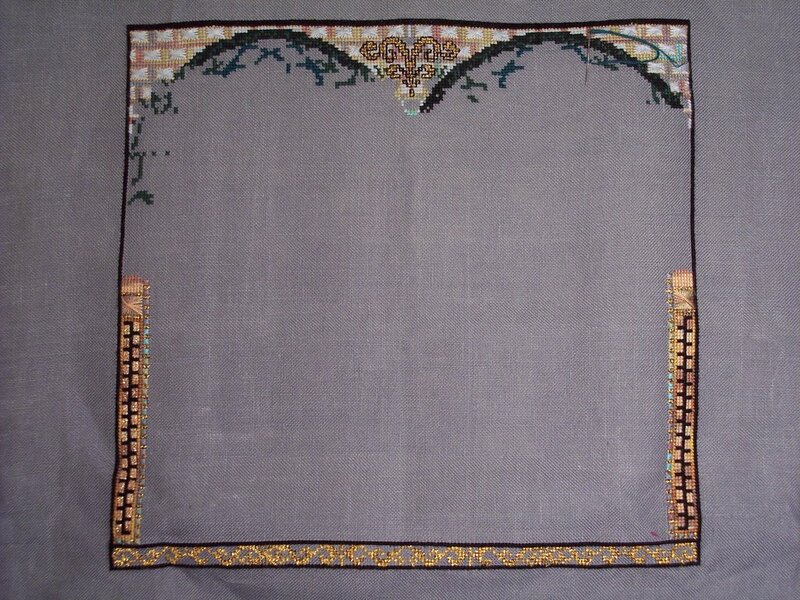 My husband finally managed to get the green background fabric green. He's still working on how to get white fabric white. Anyway, I really like this design and will probably make a few more. They go quickly once the center diamond is done. Pictures of this will be taken again once it's mounted on its box. Well, I got more done on both of these, though it's hard to see much progress. 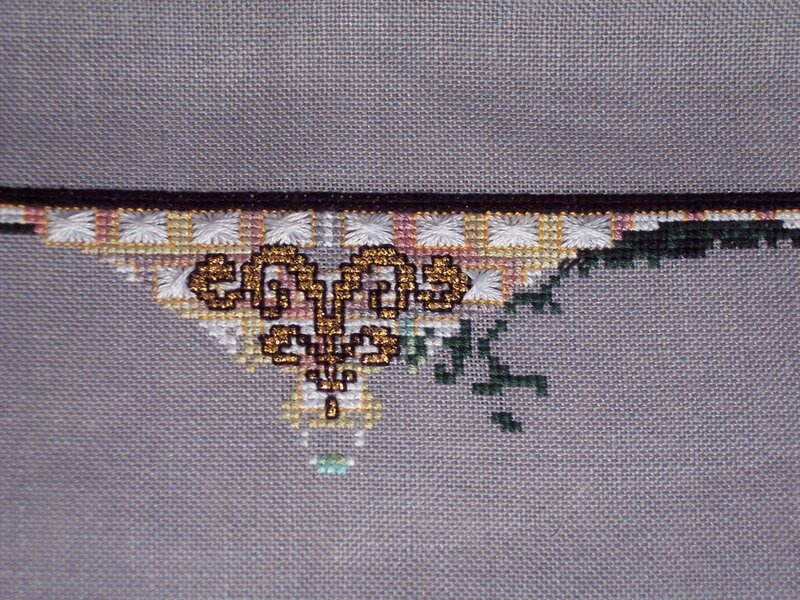 I'm halfway done with the third corner on the Medieval Town Mandala and the arch is still being filled in on the Midi Mystery. I still didn't get much stitching time this week outside of when I was waiting at other places - which means I couldn't work on these. They're not as easily transported as some other things. This coming week, though, is a holiday week and we have no visitors coming in sooooo.... maybe.... I can get some more done on them. I'm feeling bad about their slow progress. 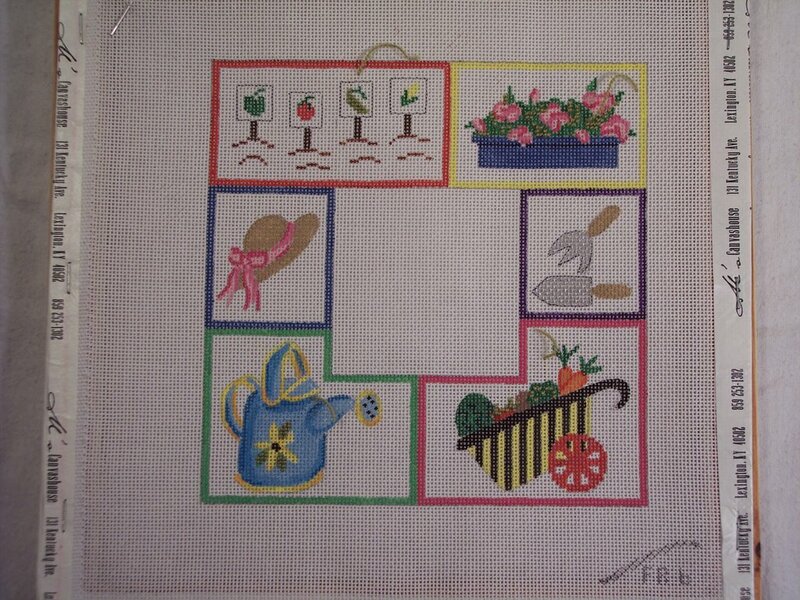 Just a few days after finishing my heart up this week, I got Muriel's Provence Round Robin in the mail yesterday. I like the way mine turned out. Muriel has some very strict rules on her stuff - a list of ten colors we can use, a size restriction and a placement restriction. I'm not putting any restrictions on mine outside of it being an "Abecedaire" (alphabet). Other than that, whatever they want. I'm sending it to Yveline tomorrow. For those interested, it took Muriel's three days to get from Martinique to here. Now to figure out a motif. 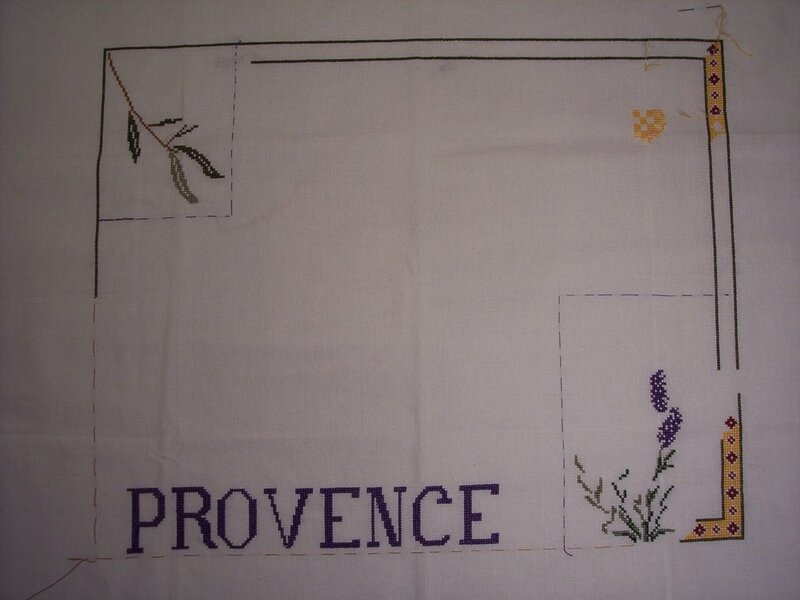 Summer in Provence - a sunburst, maybe? This is coming along ... once I finish a couple of the other things, it should go faster. I finished the rest of the green circles yesterday and should be able to get the insides of the circles started by tomorrow. 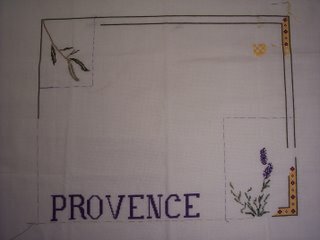 I made a lot of progress on the French round robin this last week. Since this picture was taken, I've completed two more letters. 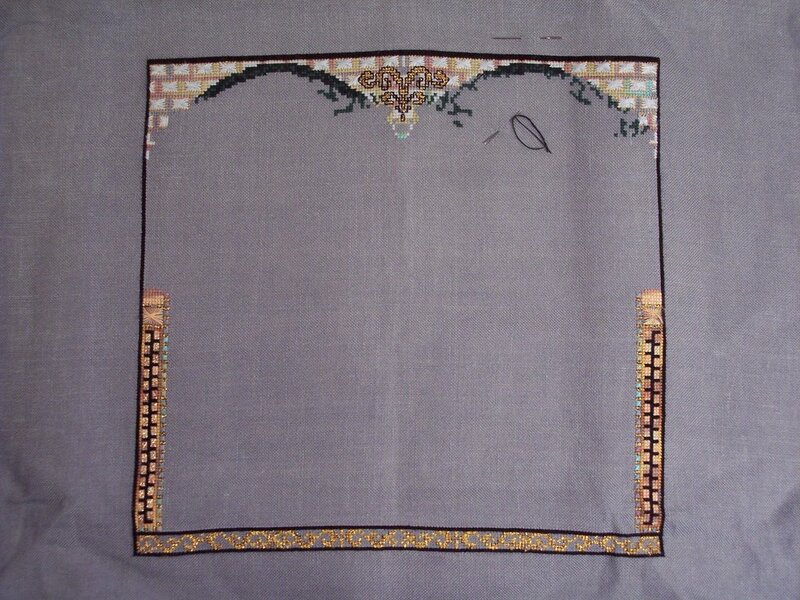 I need to get it done by the end of the week, so I'll be taking it with me on my trips to places so I can work on it as I wait for other people to do their jobs. 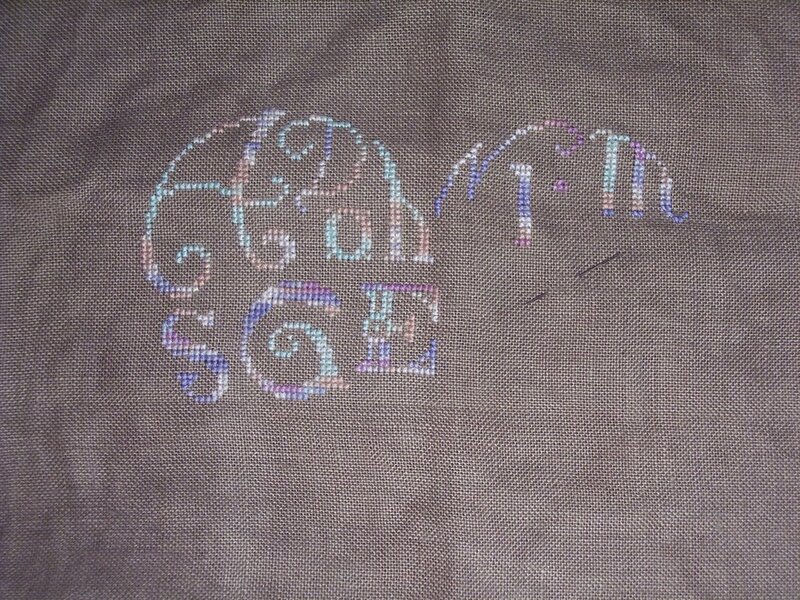 I think I can finish it ... the rest of the letters are either small or medium sized. One of the reasons not much was done on other pieces last week was that I had an ornament due for the tree my EGA chapter does for the local women's shelter. 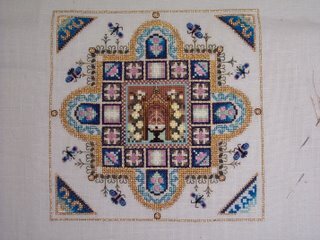 The design comes from the latest issue of New Stitches, and it took me a couple of days to do it on white 18 count aida. Our chapter made over eighty ornaments for the tree and donated them, some lights, and a six foot fake tree. We don't know where it will be, exactly, but we all hope it brings some cheer to their lives. As you can see, not much progress has been made on either of these in the last week. 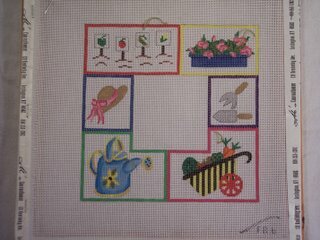 Every time I think my days are going to get less complicated, something else gets thrown into the mix to make them too busy to stitch again. There was SOME progress, though. 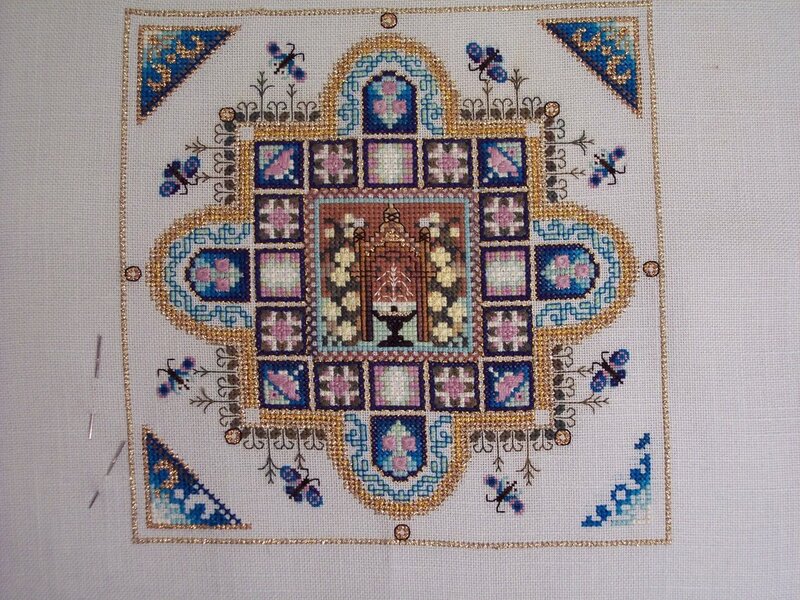 I now have two of the corners on the Medieval Town Mandala done and the arches on the Midi mystery are coming along. Maybe Thanksgiving week I'll get time ... after all, everything else is closed and I hate shopping, right? 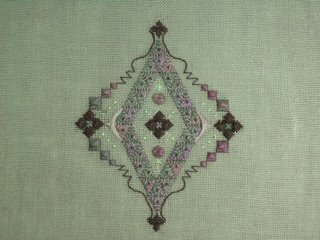 I completed the side Rhodes stitches on this this week and got the little silver accents done. In fact, when this picture was taken, all that was needed was two woven spiderweb stitches and some backstitch and whipped backstitch. I managed to do all of that at the Pocono Mountain EGA meeting last night, so it's done! 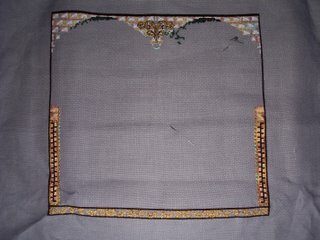 The green of the fabric doesn't show through well, but the overall effect is very very green. I'll probably do more of these -they're relatively fast. The finished photo will be up as part of next week's updates. I'm just happy to get something done off my list - which means I added back in the Ribbons and Roses purse that got bumped off. Yesterday, I dyed five yards of fabric for a friend to use in a project. These are pictures of the results. 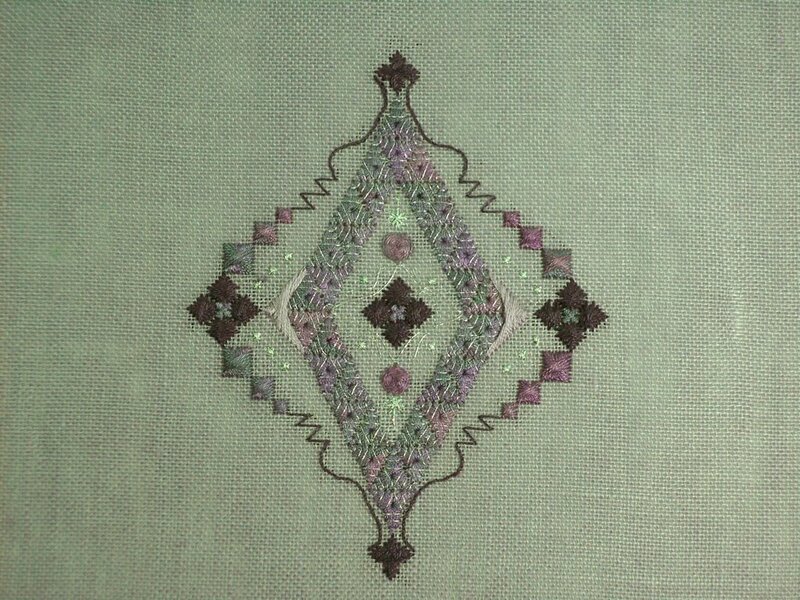 I really like the green and purple - it reminds me of a field of morning glories. I will probably reproduce that one for a complex cloth wall hanging. The dark blue "fake shibori" came out pretty well, too. Actually, all of them did, with the exception of the green spots that migrated onto the orange piece somehow. 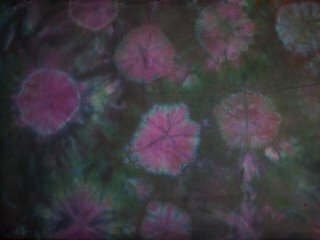 I'll probably dye some more later, but I thought you might want to see something different! 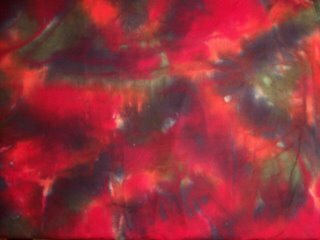 All fabrics were 100% Kona cotton and dyes were Procion. I put these two together because I didn't make much progress on them this week. I had a meeting over in Pennsylvania, a friend came over to visit, and so on. 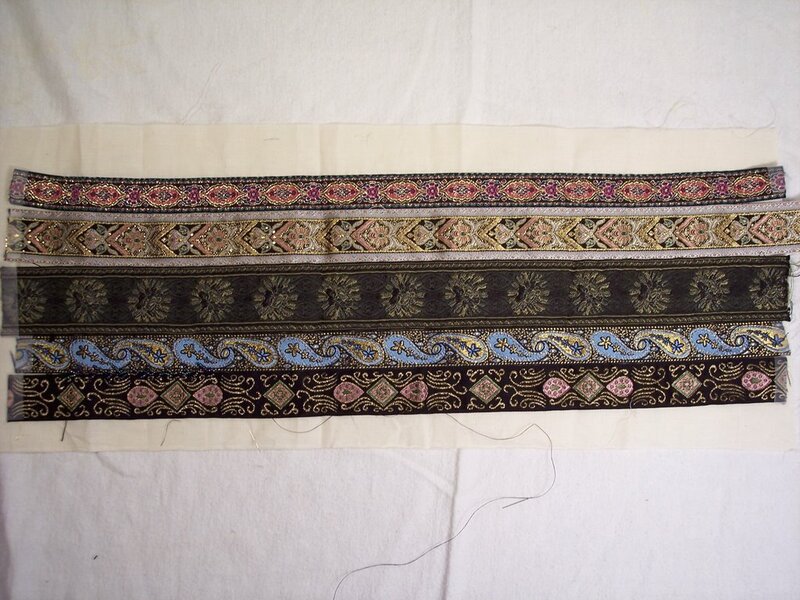 Lots of stuff got in the way of stitching. 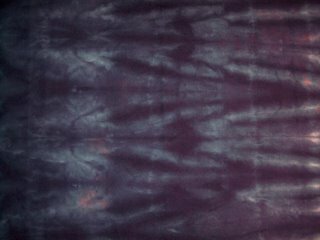 Anyway, today I've been able to get back into the groove and also managed to dye five yards of fabric for a friend. 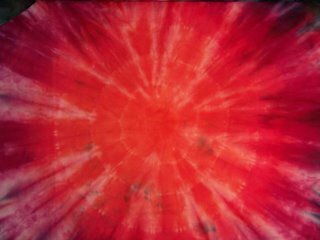 When they're all done and set and ironed, I'll take pictures before sending them off. 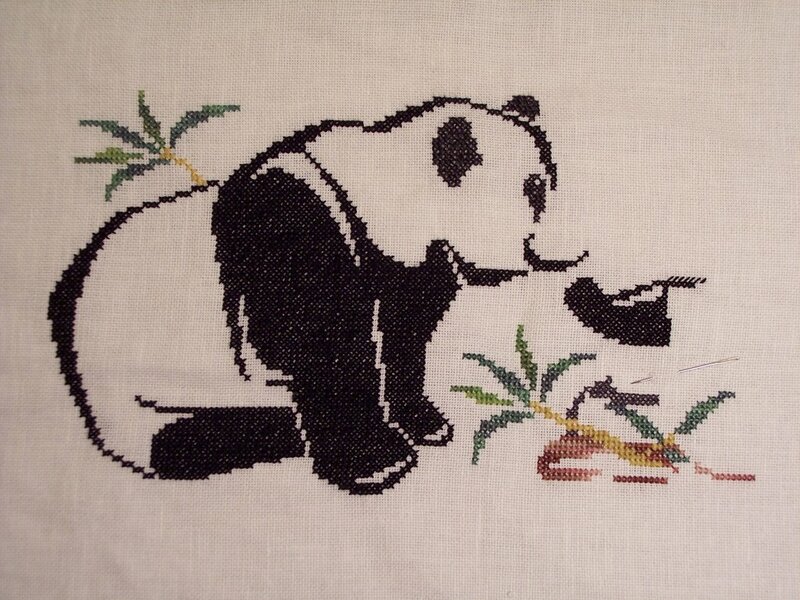 The panda is still going, not much to report. On the goldwork, I laid the ground for doing a dimensional area on the sampler. 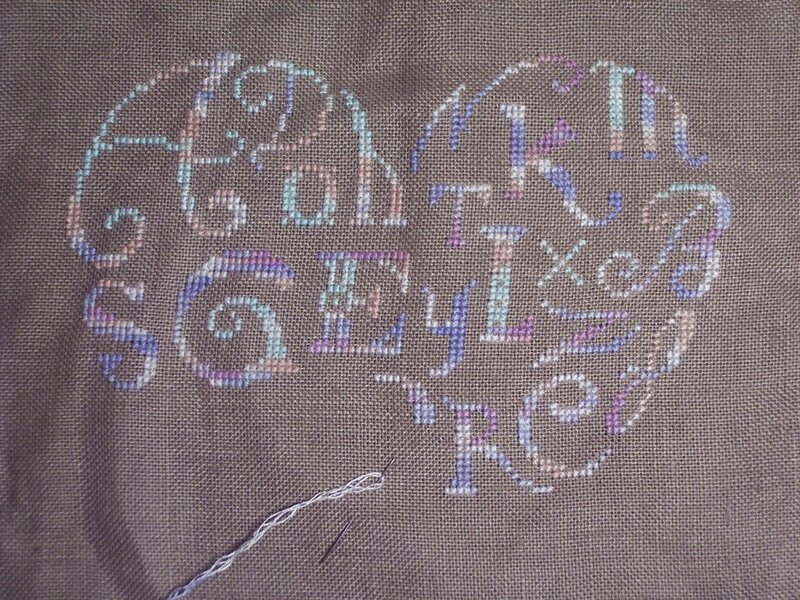 I've put everything close together because I have the idea I'll do something with the sampler once I'm done - perhaps make a small pillow or something. 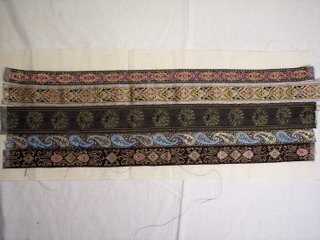 The piece I'm about to do over the string requires me to plunge the ends every single row. When I do that, I'm always afraid I'm going to damage the fabric. Lots of practice will teach me I'm not, I hope. This picture was taken just before I completed half, but it's official! I'm halfway through this piece. I've run out of a full skein of black and am starting on another, but the biggest black blocks are done. Now to get the other half done by the end of the month. 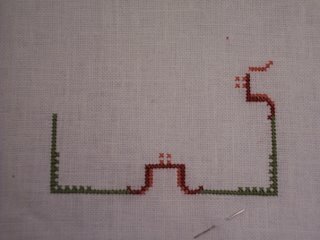 I'm almost done with a second corner and am pretty well started on a third. I'm not making much progress this week, though. I've had to stop everything to make an ornament for my EGA meeting next Monday night. 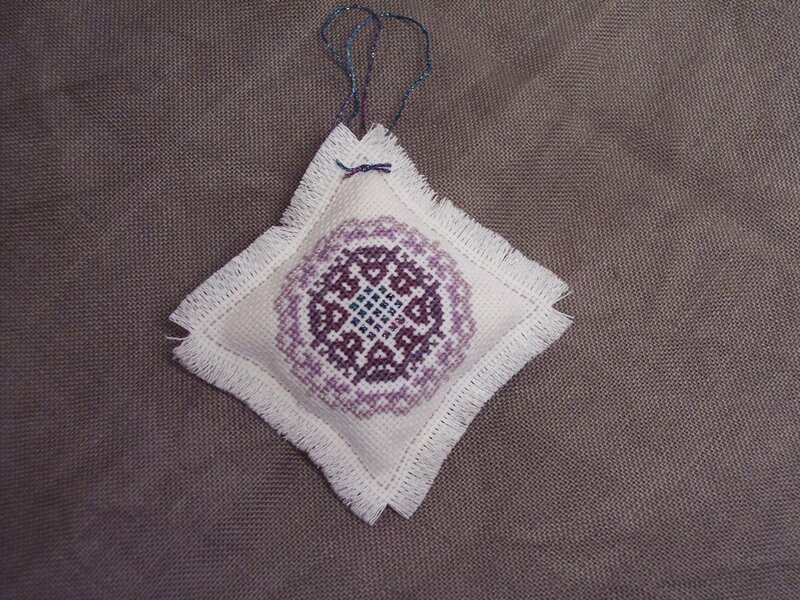 It's the second one for my requirement for the tree we're donating to the local women's shelter. I really love the colors on this, though. They make me smile every time I work on it. My husband was so embarrassed when I said it was sideways last week that he made sure and asked this week if it was the right way. And it is! Since Saturday, when the picture was taken, I've completed two more circles on the left. There are the same number as on the other side - I should be getting to the buttonhole part (a large flower) in the next couple of weeks. Another quickie that would be done if I didn't have so many projects in rotation! Since it's in Christmas colors, maybe I'll have it done in time to frame for Christmas. 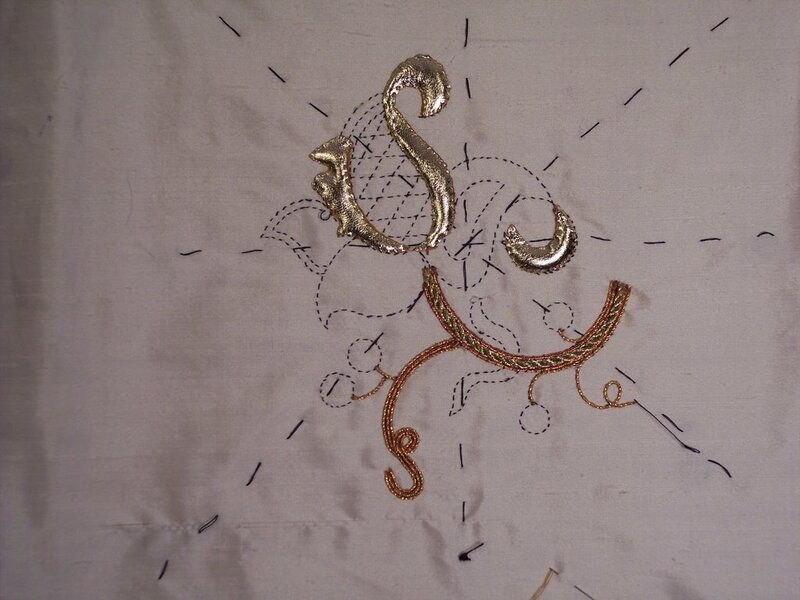 I know this doesn't look like my main piece of goldwork, because it's not. It's the sampler they have me practice on. This week, I've been learning how to couch gold thread. Had to do a straight line, then a turn, then fill a rectangle. 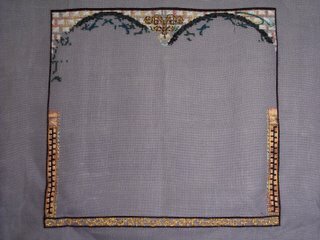 My next part is another rectangle on here with some string under the couching for texture, then I go to the real piece. 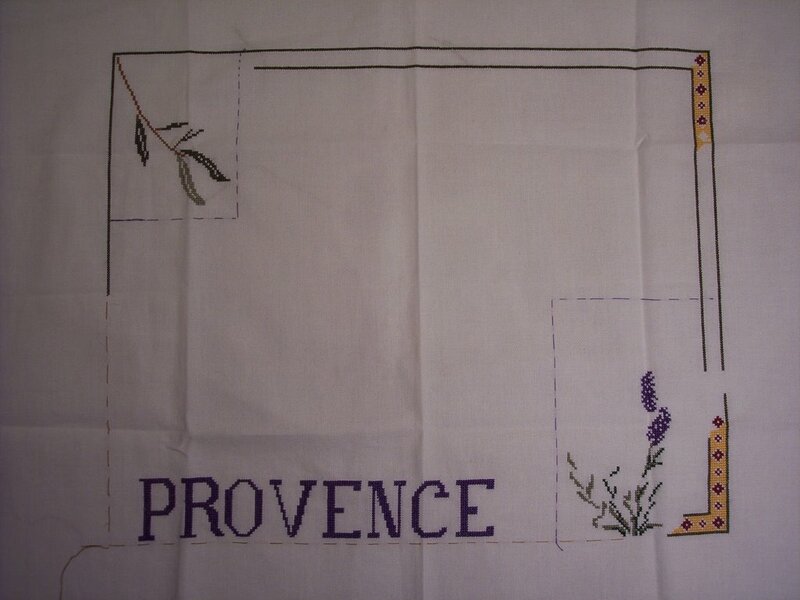 Anyway, I -am- working on this! It's way different than what I normally do. So, my husband decided to take extra pictures of this piece this week. I think he was sad I didn't give it to him to photograph last week because I'd made no visible progress. 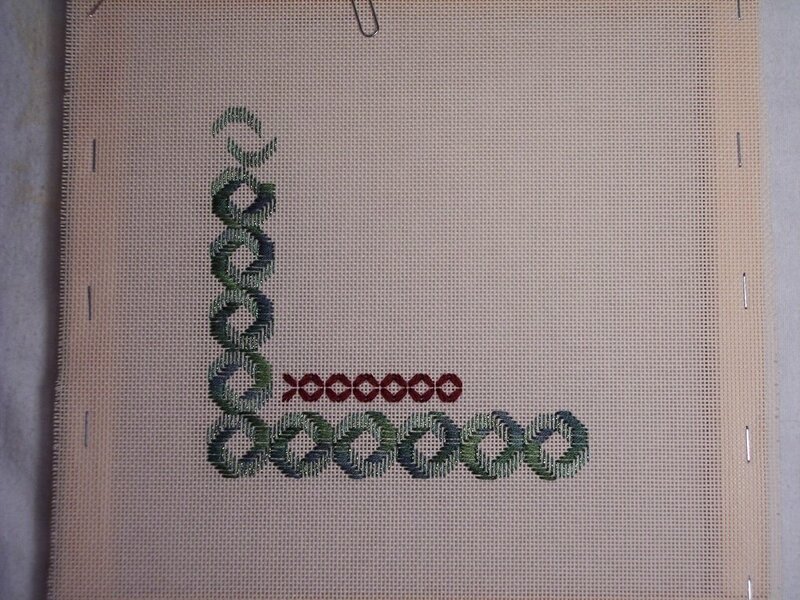 Anyway, I've started part two and it can be seen at the top, with the green stitching. He took a picture of the left column, which looks better in person. The desert sunset Waterlilies just looks so pretty! 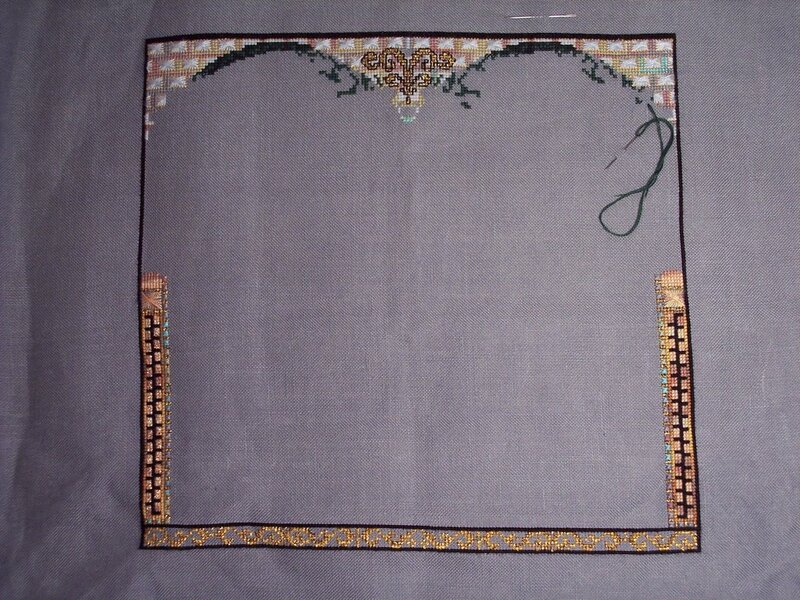 You can see my Rhodes stitches from part one better too, in the picture of the top middle. Part four was released earlier this week, so I'm farther behind again. I'll get it done eventually, though. 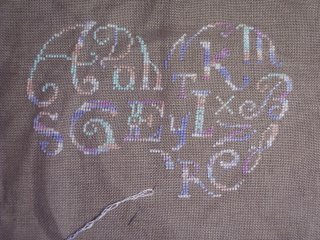 Even though my husband photographed this sideways, you can see the progress I made. 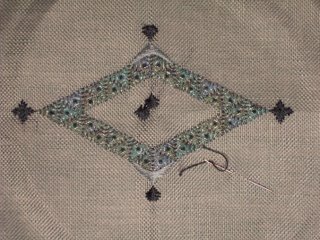 Both arch stitches are now done and all the eyelets are wrapped. 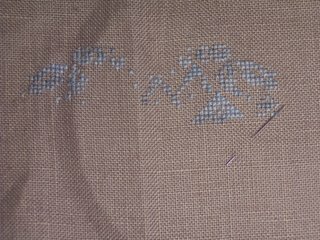 There are more stitches on this, but the majority of the stitching is actually done - the rest is specialty stitches that go quickly and backstitching. 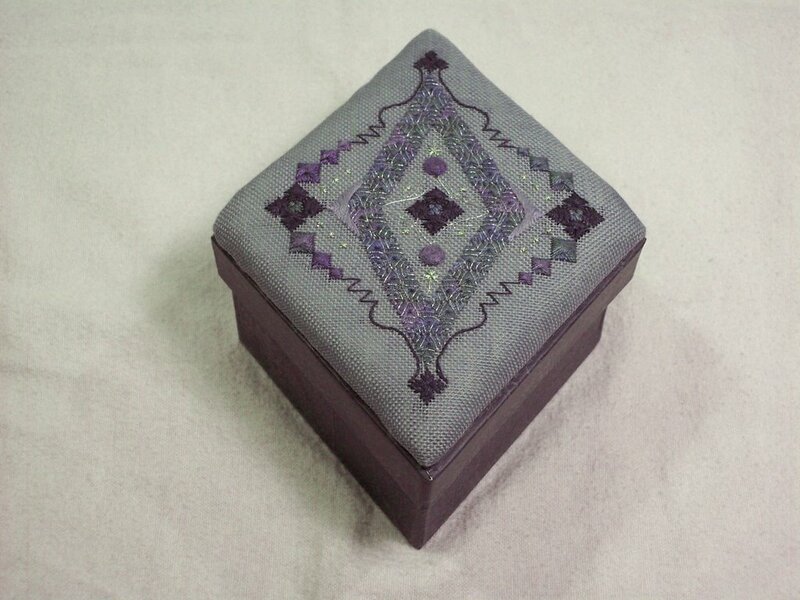 I can't wait to hand it over to my husband to block and put on the box. I'll be happy with my entries this week - I made progress on everything. Real, visible progress. 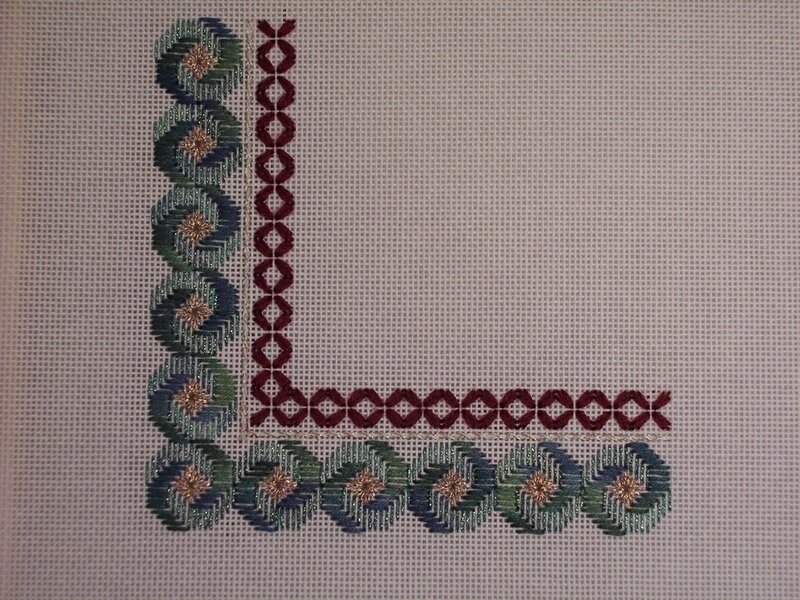 As you can see, I got five and a half more letters done of the alphabet. 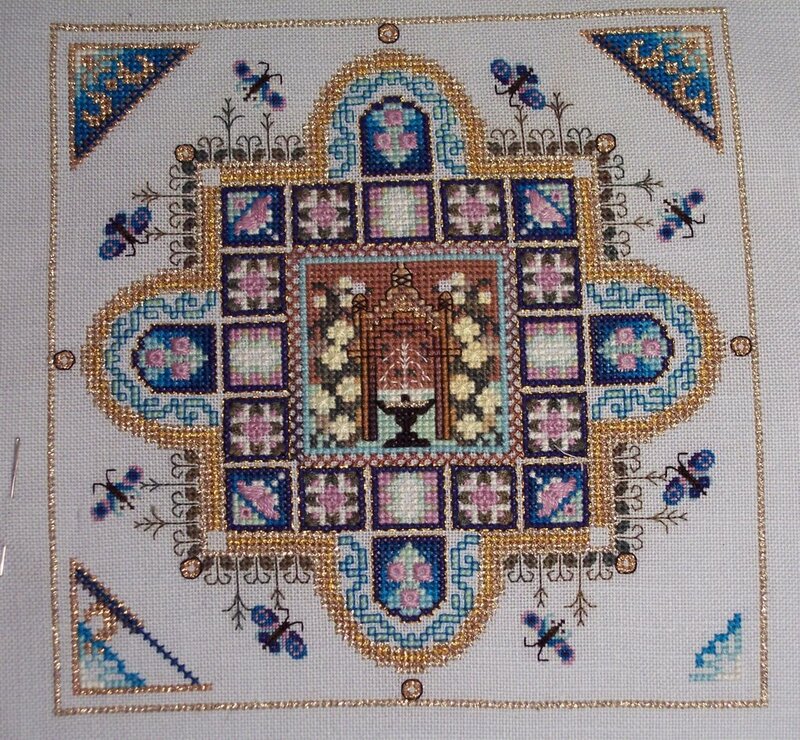 I might have to put the rest of the things on hold for a day or two to complete this by the end of next week, when I hope to get it in the mail to the next person - in France. Who knows when I'll get it back? It's looking pretty good so far and it's not that big a project. I needed some small things. Being the social stitching glutton I am, when I got my last issue of de fil en aiguille, I signed up for the round robin. In French. I don't speak French and -barely- read it. But so it goes. I'm in a group with five other people, all of them Francophones. 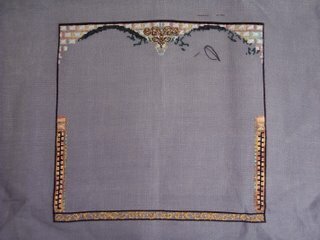 We have six months to finish six pieces and so - this is the start of mine. I need to have it done in a week and a half. 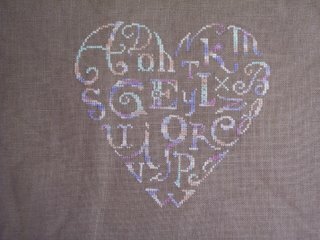 The design is an alphabet heart that I downloaded from the Australian version of Better Homes and Gardens. I'm using Pistachio Nut waterlilies on R&R Reproductions 28 count 18th Century Rock. Coming out well so far and stitching up pretty quickly. So, Wednesday night I got home from Seminar and Saturday I went to a class with my local chapter. 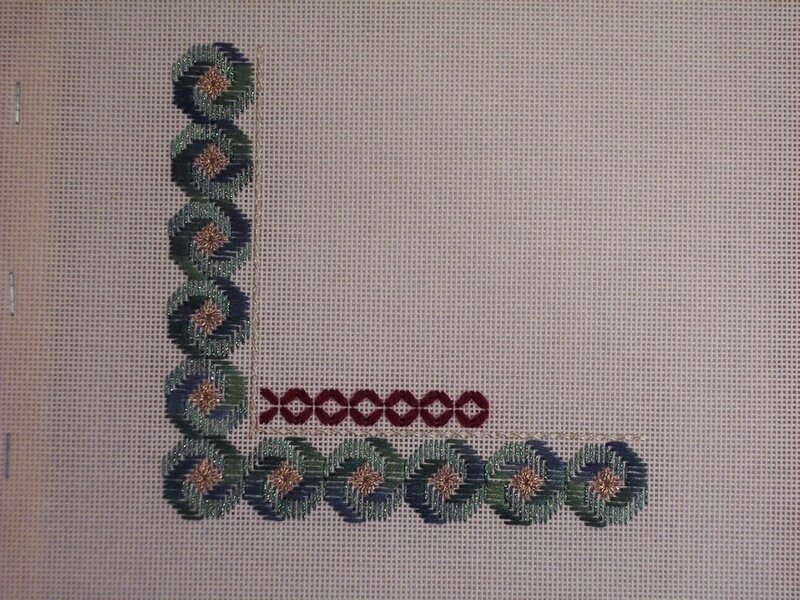 This is the piece we started - Bargello and Buttonholes from a fairly recent issue of Needlepoint Now!. It's tilted 90 degrees - the long part that's done is supposed to be at the bottom. I did it in the Christmas color scheme. 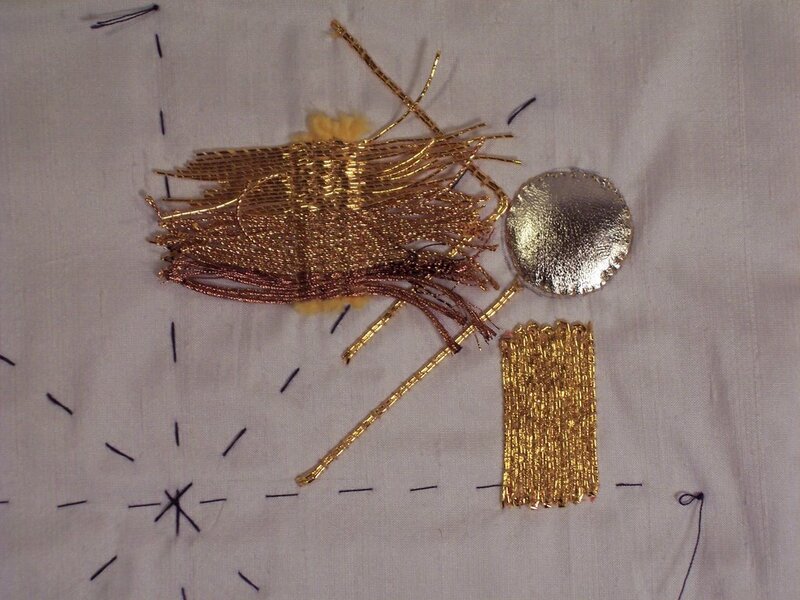 I'll be adding in gold since the ecru pearl cotton they called for. Guess I'm going to make it gaudy. Anyway, it's going pretty quickly. Maybe I can finish it soon, too.